Federal and Massachusetts laws require employers to post notices informing employees of their rights and protections while performing work for their employers. 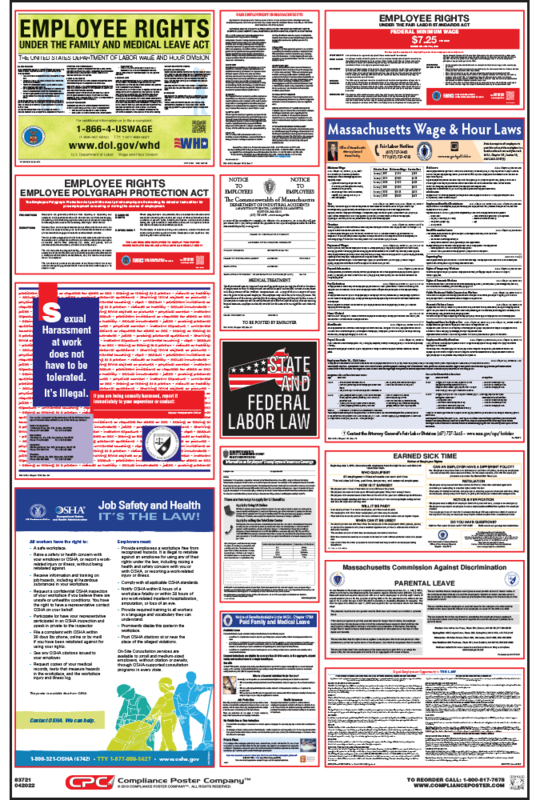 Massachusetts Labor Law Posters contain each of the state and federal mandatory labor law notices that must be posted in the workplace. In Massachusetts, employers may also be required to post a separate city or county poster depending on their location. (HB 4640) Paid Family and Medical Leave, effective July 1, 2019. OSHA Job Safety and Health, It’s the Law! Required Massachusetts Unemployment Insurance Benefits Pamphlet. Must be provided to all employees who are separated from work, permanently or temporarily. Massachusetts No Smoking Poster: The Massachusetts Smoke-Free Workplace Law prohibits smoking in workplaces. Pharmacies who offer MassHealth co-payment services are required to post the MassHealth Pharmacy Copayment Poster. Staffing agencies must display the Massachusetts Temporary Workers Right to Know Poster. 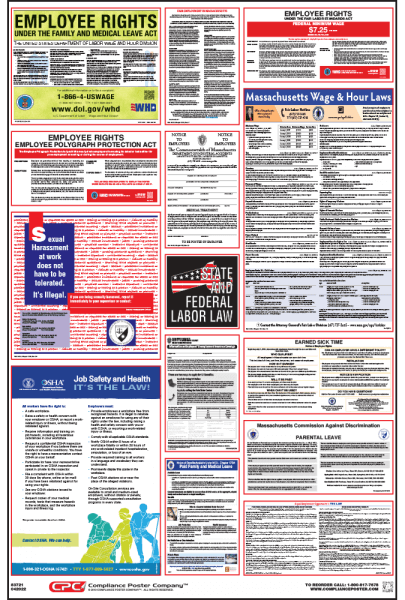 Visit out City/County Labor Law Posters page to see if your location is covered by any local posting requirements.